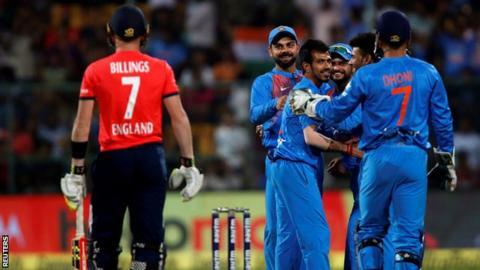 England lost their last eight wickets for eight runs as India powered to a 75-run win in the third Twenty20 in Bangalore to take the series 2-1. Chasing 203, England were 117-2 with eight overs to go after three Eoin Morgan sixes in a Suresh Raina over. But leg-spinner Yuzvendra Chahal (6-25) got Morgan and Joe Root in successive balls and England fell to 127 all out. Raina and MS Dhoni both made half-centuries in India's 202-6, while Yuvraj Singh blasted 27 from 10 balls. That total was around par on a surface ideal for batting, but the sort of collapse that characterised the Test series loss means that England have been beaten in all three formats. Although Morgan's men competed best in the T20s, they have lost a series in which they won the toss on all three occasions. Whereas their bowlers impressed in the opening two matches, here they were blitzed, with the batsmen falling in a familiar heap against leg-spin. Their slump was the second-worst eight-wicket collapse in the history of international cricket - New Zealand lost 8-5 in a Test against Australia in 1946. Only once before in all T20 cricket, either international or domestic, has a side lost eight wickets for eight runs or fewer. England have only once successfully chased more than 200 to win a T20 international, but were well placed despite opener Sam Billings falling to the first ball he faced - an inside edge onto his boot that found slip and gave Chahal his first wicket. Jason Roy wasted a good start - his 23-ball 32 ended when he top-edged the second of India's leg-spinners Amit Mishra - only for Morgan to arrive and pick up the pursuit. Targeting the part-time off-spin of Raina, Morgan helped take 22 from the 12th over of the innings to leave England needing 89 from the final eight. However, with Root beginning to struggle at the other end - he went 13 deliveries without finding the boundary - Morgan was held on the leg-side fence off the returning Chahal for 40 and, from the next ball, Root was pinned leg-before to depart for 42. From there, it was a procession as Chahal and second T20 match-winner Jasprit Bumrah ran through the lower order. Jos Buttler miscued pacer Bumrah to mid-off, Moeen Ali fetched Chahal to long-on and Ben Stokes pulled the same bowler to deep mid-wicket. Liam Plunkett, Chris Jordan and Tymal Mills all failed to score as the last eight wickets went down in only 19 balls. India's stacked batting line-up had struggled on slower pitches in the first two matches, mainly down to the excellence of England's bowling. Here, they fired in a blur of boundary hitting, even though captain Virat Kohli was run-out by bowler Jordan for only two after being sent back by KL Rahul. As England missed their lengths - only the pacey Mills was close to the levels of the first two matches - Raina in particular cashed in with power square of the wicket on the off side and pick-ups off his pads. He smashed five sixes in his 45-ball stay. At the other end, Dhoni showed more finesse and the occasional deft touch, but he too cleared the leg-side fence twice in his first international T20 half-century - the 76-match wait for a maiden fifty easily the longest by any batsman. But the most brutal treatment was dished out by Yuvraj, the man who once hit Stuart Broad for six sixes in a over. Jordan, previously dependable, was punished for failing to nail his yorkers and three times pummelled back over his head for straight maximums as India took 118 from the final nine overs. England captain Eoin Morgan: "We made a fatal error in losing two 'in' batsmen when we were going so well. It really hurt us. You have to give credit where credit is due, congratulations to the Indian team. "With the benefit of hindsight, we could have done with Joe or I to see out the innings. It's a beautiful wicket to bat on with a small boundary we would have taken conceding 190/200 at the beginning at the game." England coach Trevor Bayliss speaking to Sky Sports: "The way we finished tonight is not an indication of the way we have played on this tour. But we have to give credit, India have played better than us. "We're not world-class players of spin yet and it is difficult to knock the ball over the fence. I'd like to see our guys hit down the wicket rather than sweep sometimes. "A lot of times the guys have been out playing across the line but that's something we can learn from and make sure we're better at next time we play here." India captain Virat Kohli: "This was an occasion that demanded us to be at our best. Everyone was looking forward to this game. We lost all three tosses but won the series. We have shown character to win all three series."